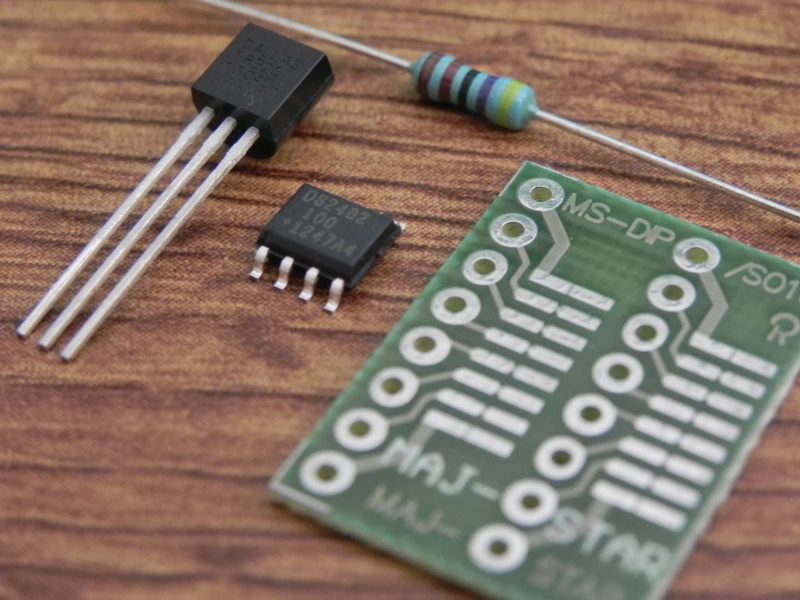 There are 2 ways of connecting DS18B20 thermal sensor. 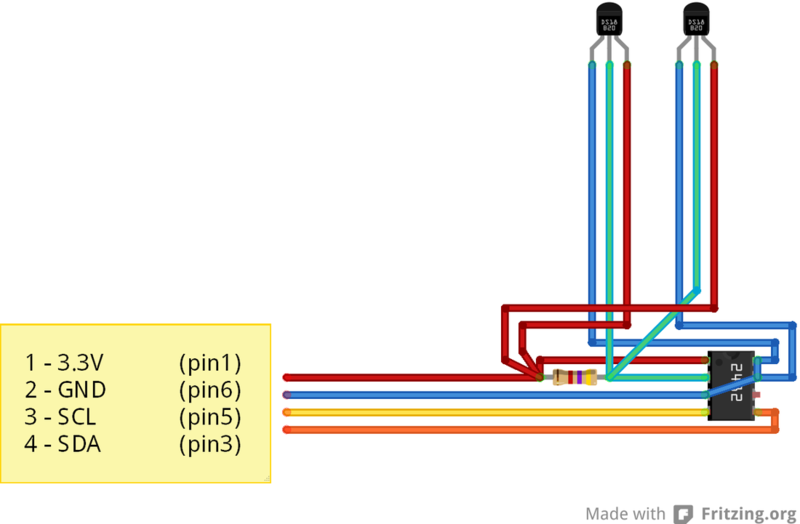 Via emulated 1wire bus, which have some major disadvantages. First is that 1wire data link is acting as very long "antenna" which catches interferences. 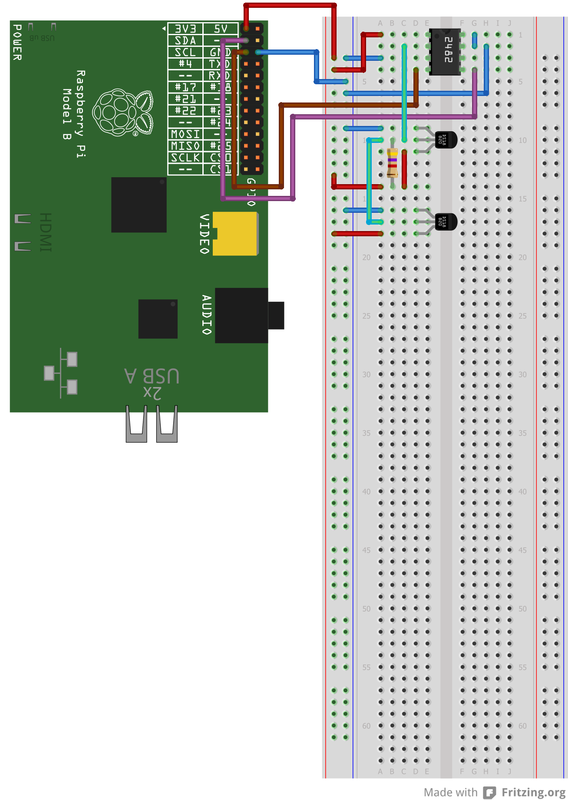 1wire bus on RPi is not implemented in hardware, but only as software on GPIO4. 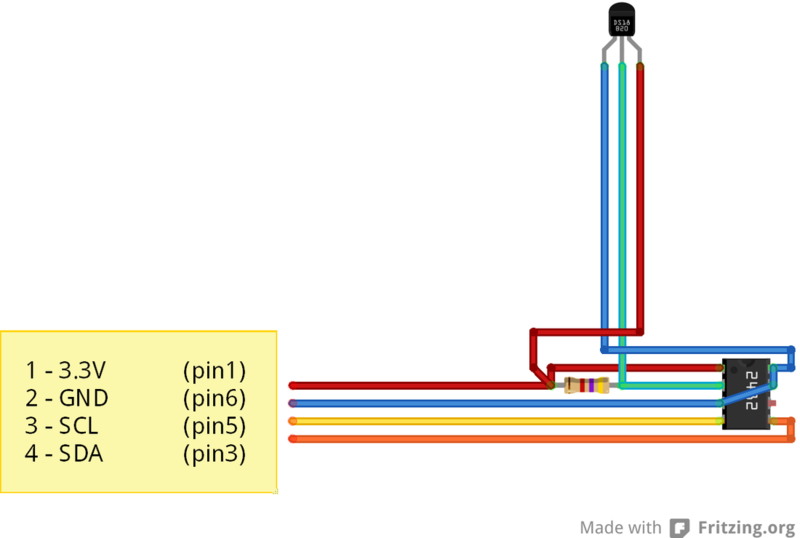 GPIO pins on RPi are directly connected to CPU. So every interference cought on 1wire bus is transported directly to Broadcom SoC which can be easily destroyed. This kind of 1wire bus should not be longer than 10-20cm or you risk damaging RPi. 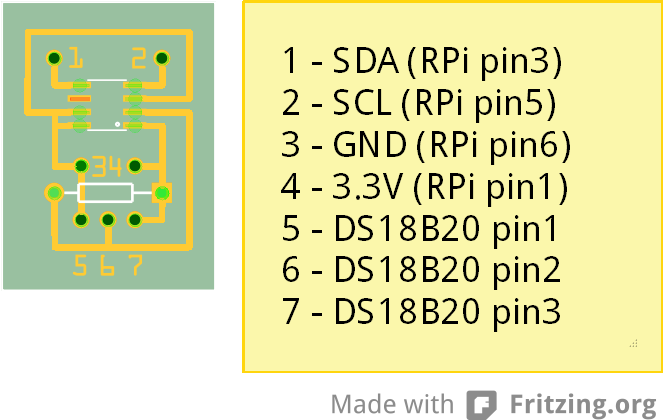 Maybe you are asking why to use I2C to 1wire reduction, since there are also thermal sensors which you can connect directly via I2C (TMP102 for example)... There are at least 3 reasons - I2C thermal sensor is much more expensive, has limited accuracy (+/-2°C) and limited maximal length of bus. On the other hand, thermal sensor for 1wire (like DS18B20) has better accuracy (+/-0.5°C) and data line can be 100m long (in case of parasite power supply and pullup transistor up to 500m!). And use of reduction means that all interference from long 1wire data line is filtered by integrated circuit, which costs less than 1€. When you have thermal sensor connected, we can setup Raspbian to be able to read temperature. At first remove I2C modules from kernel blacklist. Close file (CTRL+X...) and save changes (...press "y" and Enter). Now install some tools to work with I2C. You can check that something is "alive" at i2C bus. The thermal sensors is connected at address 18. Now we know that thermal sensor is communicating and we can try to ask it for temperature. For this we will need to install owfs and ow-shell package. Now create a folder in /mnt for example. Close file (CTRL+X...) and save changes (...press "y" and Enter). Now you edited configurations of few services. It is good to restart RPi to actions take effect. And there you will see folder named something like 28.C2D5C4040000. This number is serial number unique for every DS18B20. "cd" into this directory and list. Close file (CTRL+X...) and save changes (...press "y" and Enter). With this connection, thermal sensors work on 50m. I can not test further distances because I do not have such long cables. But it should work for up to 100m. How to implement parasite power supply for thermal sensors and pullup transistor is detaily described in DS18B20 datasheet here (page 6). Only connect pins 1-4 to RPi. On pins 5, 6 and 7 will be connected DS18B20 with up to 100m cable. 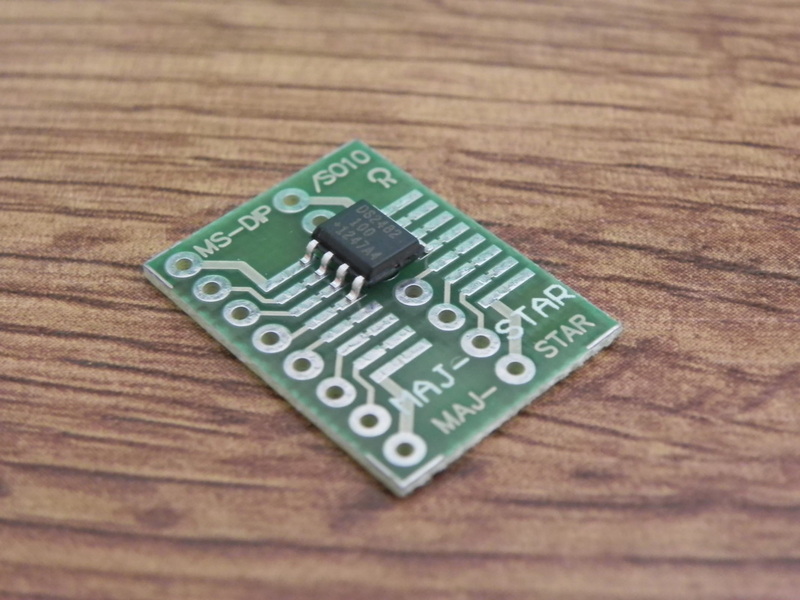 Dimensions of this PCB are 20x30mm. Maybe one day I will order a few pieces. Program can be stopped by keyboard shortcut "Ctrl+C".